I will first have to admit that I've only briefly explored Vine, so this is very much a first impression. However, I liked what I saw and think that it will expand the way that we think about video. Other than the ethereal whispers that I heard of it on Twitter, the first real exposure I had was Ann Handley's review over at Marketing Profs. She’s got her finger to the pulse of content creation, so I figured it was worth looking into. I don’t think that Vine stands alone as a social network. It doesn't allow for enough navel-gazing because you literally have to point the camera at something else. Of course, you can still take video of your food (or how to make it) but without an easy way to video yourself I don’t see it as a platform for conversations in 6-second snatches. Plus, since it’s linear media, you can’t go back and edit down to the perfect short expression (if you've ever spent 10 minutes editing a tweet, you know what I mean). If producing videos with Vine does not necessarily mean distributing them to a Vine network, then what’s the point? For me, it’s not the platform that looks most interesting, it’s actually the App, the tool with which you create your videos. Vine works differently than other video recordings because there is no “Rec” button, it only records as long as you are touching the screen. The real power of Vine isn't in creating 6-second videos. It’s in using your 6 seconds to capture multiple snippets of video (animated GIF style) that work in a bigger context. Taking advantage of the quick start/stop ability within the same clip means you can capture something that could take a rather long time. This is why Vine is interesting to me. Vine doesn't have editing capabilities but it allows for ‘non-linear shooting.’ Now, the consumer can do the same kind of planning and use Vine’s unique capture method to get multi-shot flexibility. Suddenly, you have to think about things more of the technical aspects of video, and I believe that will raise the overall level of competency (for those that take it serious). Admittedly, you cannot take the best few seconds from multiple takes, but you can quickly throw away takes that don’t work and hone in on what does. Well, I think that artists are going to take the lead with Vine because it gives them a lot of room for expression. But, business can take advantage of the format too. Product Videos - There have already been a few examples of companies showing products with Vine. It’s definitely less polished than what a professional video company can do, but it puts tools closer to the front-line to get video created. And, it could have potential for user-generated product videos. Culture Videos - Company culture has become a significant driver of customer loyalty and recruiting. Vine can provide a simple way to share some of the “who” behind the corporate walls. Social Content - Vine provides another tool you can use to create more content that’s easy to push out to social channels. It can be ephemeral and light, something that captures a moment and then disappears as the stream continues. User-generated Content - Customers can generate videos at the point of interaction with a business. Or in other situations where they are using a product. It may not be spontaneous but smart businesses could find some interesting ways to use this. Advertising - Is this the rise of the 6-second spot? Short video ads that can be promoted to other social channels. Looped videos - You can’t think linearly because your video isn't going to get to stop at the end. It will repeat forever (unless you touch or click to pause it). Think about how it’s going to look the second time through. Sound of Silence - Sound does get captured with your video. Even if you stay quiet, you’ll have the white noise of video. However, it seems that videos embedded on the Web default to ‘mute’ so you might not want to count on your voice-over to convey your point. I’ve browsed around the Vine app’s curated tags to see what people were doing. If you have the app, I recommend spending a bit of time scrolling around. Look at the good, look at the bad, and decide if it’s something you think would be worth trying out for yourself. Product Documentation. Everyone has it. Often it's in the format of a thick manual, many-megabyte PDF, or online knowledge base. Every detail about your product is included... somewhere. They are new to the product and need something to provide them with a way to get started. They have an intermediate to advanced knowledge of the product and need to find information on a specific feature. But when you look at how documentation is presented, it is primarily clustered around product menus and runs through everything possible within that section. Going into too much detail for the beginner and compiling more information than the advanced user wants to sift through. So how does a company go from producing this kind of documentation as a necessary evil to making it an integral part of their user-experience and a rich source of content that can be mined for other uses? Many of the principles of content strategy are applicable here. While the work isn't easy, it is possible – especially if you have a resource that you can dedicate to transitioning your existing documentation into new, compelling content. First, identify your audiences. Who are the end-users of your product? What makes them log in to your software every day? What areas are they currently struggling with? Your internal search is a gold mine for the last one. Next, you want to look at your external facing content, do an audit of your marketing collateral, and understand the story that you are telling. Where are the similarities between prospective audiences and customers? How does your story evolve in the context of your customer base? What story do you want to be telling your customers? The clear sense of audience and story will give you the foundation for the tone and style that you should use for your content. With this in place, you can move onto the next steps to determine the structure of your product content. Creating your product documentation structure includes creating a classification system and taxonomy. This will provide a framework for both your current and future content needs. The classification typically falls along lines similar to your navigation. Features can be grouped according to where they fall within the menus of your product. Your primary objective in the classification is to ensure that you can account for all the buttons a user may need to push. But, you know there are additional attributes that define features beyond where they appear in the navigation. This is the purpose of developing a taxonomy. These are the additional axes that provide context and will allow you to serve up content that pinpoints your users' needs. Use Case Processes – Getting Started, Search Engine Optimization, Etc. You are now able to create a flexible taxonomy that accurately represents the context of content needed for each product feature. How does this taxonomy help with content creation instead of making it an unwieldy process that already looks out of control – and you haven't even written a word yet! The taxonomy then allows you to separate form from function. First, is the form. Chunked content built it in pieces around a specific feature, or feature-set, using the taxonomy to determine the content objective, depth, and format. Second is the function. 'Playlists' of content that connect elements of the taxonomy. For example, a Beginner's Getting Started guide, or an Advanced Search Engine Optimization guide. Users are provided with a context-rich experience that targets both features and intent. These playlists can also be generalized to form the basis of additional external information – completing the circle of using your product documentation as another source of compelling content. I was having a conversation with Peter Kim the other day and we were talking about how it doesn't seem like people are talking about social media as much as they used to. Is it possible that we've left the echo chamber? As I was thinking about this, I wondered if there was a model for the phases people go through in their social media conversations. This is what I would propose to show how people progress as they use social media platforms. This is when someone has initially heard about a new social platform. They may talk about it with their friends or read what people are saying about it on a different platform. It's unlikely they've tried using the platform yet; they may even go as far as to claim they won't use it. After someone has joined a social network, they start to feel out how to use it, connect with other people, get down the 101 basics for the platform. They also start to look for influencers on the service, the people that have already forged a path. This is the phase when people start to publish content about the platform. As they have learned the 101 lessons, or started to get their own insights, they want to share with other people how to get into the platform. This stage does reinforce people's use of the platform but can also create the echo chamber effect where original content gets drowned out. At this phase, people are still talking with their friends or other people interested in the platform. This tends to drive the topics of conversation towards mutually shared interests -- typically social media -- rather than content about their business. In fact, people that skip this step and just start broadcasting all about themselves are usually ignored. For me, this is the threshold that indicates long-term adoption of a platform. When someone understands how they can use the platform effectively for their personal or business purposes. They stop spending so much time talking about the platform, or sharing the 101 tips, and begin to use it for the reasons that make sense for them. This is also why it is difficult to find (or create) social media content that moves beyond a 101-level. Once you start looking at deeper use cases for a social media platform, it becomes specific to the needs of your business. That is hard to translate into general practices that other people can follow. At this stage, people have figured out where the money is and they are going for it. I would say that most people who have incorporated social media into their professional role, and have been doing so for a while, are more likely to be in this phase, and for those of us connected with other social media professionals, this may account for why we aren't seeing as much content being published about the platforms. We have figured them out and are using them for business now. Once someone is familiar and comfortable with the tools, it starts to get integrated into their other social platforms. I don't just mean cross-posting, but really creating a value network for their own business that allows their customers to find consistent messages, response, and personality across different social media platforms. This is happening quicker on a personal level where people manage their own 'brand' across all the platforms, but I believe that we are starting to see - and will continue to see - this happen with brands. Smart brands are looking for how they can take the successes from each social media initiative and use them to improve their presence elsewhere. The lessons don't translate directly from platform to platform, but the power of working cohesively across social media channels is the next frontier in social business. I had a very positive experience this week with Apple. Let me relate the story. The backlight on my iPod Touch went out and I'd been meaning to get it checked for about a month. I finally took it into the Apple store to ask if there was anything to be done. As I was passing it over to the Apple Genius, he dropped it about 4 inches to the table we were standing by. He checked out the iPod, cleaned out the connection area, basically tried the simple things to see if it could be coaxed back into working. When this failed, he said he'd check what it would cost to replace. He came back with a quote that was more than I really wanted to spend, and he recognized it before even giving me the number. So he said that he needed to check in the back again. When he came out he told me that because he had dropped it, they would replace it for me at no charge. In essence, he found an excuse to provide me with over-the-top customer service. This was more than I had hoped for and expressed how thankful I was for that. They didn't have any in-stock yesterday, so he took my number to call me when it arrived. I got that call today. And I'm now in the process of re-downloading everything to my new iPod. Sometimes you do want your customer service reps to find excuses, just make sure they're looking in the right direction when they do. 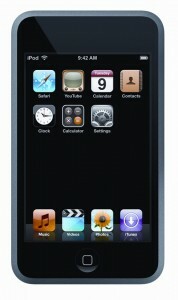 I will definitely be going back to Apple for the next shiny new device that they come out with. I had the chance to grab a quick video from my friend Kelly Stonebock a little while ago. She shares her experience coming to Austin and getting involved in Twitter. And, if you haven't read her blog, it's got a great voice. Try it, you'll like it. As someone who has found a job through Twitter, I can agree with the power of networking that she's talking about. I had the chance to sit down with my friend Bryan Person a little while ago and ambushed him with my Flip cam to answer one question about social media marketing. He handled it without hesitation and had this advice about using facebook as a marketing channel. I want to expand just a little on his point about consistency. Consistent publishing is a challenge because it requires dedication after the 'honeymoon' phase of kicking off a new social media project. After you've gotten approval to launch a new channel, it's very exciting, and you want to prove that it's going to be effective. The motivation to produce content is high -- and because it's a high priority the time to produce it is easier to block out. But once you've proved that it works, or you've built a decent community base, then other priorities start creeping back in. The channel becomes another project to manage among multiple priorities and it's easy rationalize scaling back on content creation. What you should keep in mind is that content creation is a self-feeding cycle. When you are producing, your community is going to remain more engaged. They will be more likely to add their own input, generate additional content, and share what you have created. You are then able to build on what the community is doing with more of your own content. On the other hand, when you slow down your publishing schedule, the community expects less from you, they become less engaged. Your metrics start to dip, which may raise internal questions about the value to spending time on the channel. At it's extreme, this leads to abandoned pages, leaving a constant reminder that you've given up on it. How can you maintain your publishing consistency? 1. Create an editorial calendar. Even if you just have a list of topics that you want to cover during the month, a sense of direction will help you stay motivated. 2. Read other people's work. The ability to comment on, or make a short post with a link, to news, entertainment, or other opinions can be an easy way to keep content flowing. 3. Cross-post from other channels. If you've got events happening, or are posting to other social media channels, find ways to re-use that content. It helps you extend your reach and reduces the volume of new content you have to produce. What are you doing to keep up your consistency? Traditional wisdom stands up because it's proved over time. In the case of this quote, it conveys the significance of setting clear boundaries and knowing how to respect those boundaries. This is often a challenge for Sales and Marketing teams. Neither wants to give up control over the fruits of their labors but each has expectations of what the other will do when leads or prospects are "passed over the fence" so to speak. This post is going to talk about the theoretical boundaries and then how to implement real fences. Both pieces are important and many companies get through the first step. Let's start with that, see what it looks like and if you can see why it's not enough. Once you have those, or other definitions that make sense for your business, you need to build fences. Fences means you remove ambiguity from your database about who owns what and what actions can be taken. I'm going to use Salesforce.com for my next set of examples because it's what I'm most familiar with. Lead Owner -- The Lead Owner should be assigned to show who will primarily will be interacting with the person. Lead Status -- Each value should be "owned" by one team or the other. There should be clear reasons when a lead status should change, and who is responsible for doing it. Opportunity Stage -- Marketing doesn't typically contact "Open" opportunities on which the salesperson is actively working. However, for Stalled opportunities that would make good candidates for nurturing, marketing should help retain and re-activate these prospects. Customer by Segment -- Once a customer has purchased, the relationship likely changes again. By setting up some clear marketing tracks around segments you can define and mark in your database, you can help your existing customers learn more about other products, upcoming events, and other opportunities to continue interacting with your company. So, as a marketer, how do you know if you've got good fences? An easy litmus test is if you have to get your lists approved by Sales, 0r if you send them a list, and they return it with "Include/Exclude these...", then you have not built good enough fences. Giving each team responsibility for keeping their own data clean will make it easier for both sides to work together. How are your fences? And what can you do to make them better?